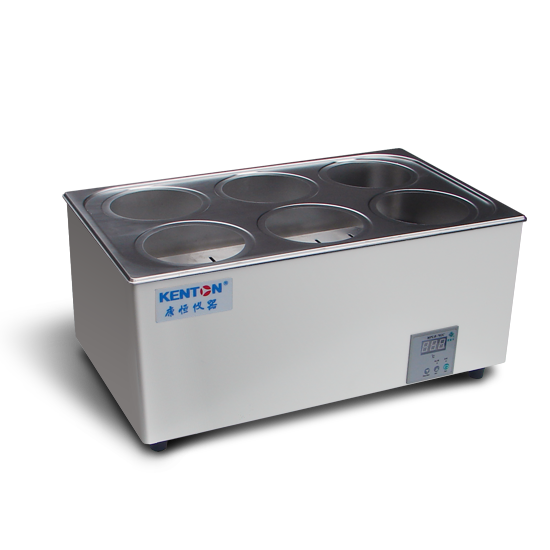 Digital display constant temperature water bath pot is one of the necessary equipment of laboratory equipment. It can be said that almost every laboratory will have a constant temperature water bath pot. It is mainly used for distillation, drying, concentration and biological products. It can also be used for constant temperature heating and other constant temperature tests. It is a medical hygiene, Medical College inspection, laboratory and industrial and mining enterprises. The equipment used by scientific research institutes for constant temperature auxiliary heating. Stainless steel tubular heaters are placed horizontally in the constant temperature water bath pot, aluminum shelves with holes are placed inside the tank, and composite rings with different calibers are arranged on the top cover, which can adapt to different calibers of flasks. There are water hoses on the left or rear side of the water bath pot, electric boxes on the right side of the constant temperature water bath pot, temperature control instruments and power switches on the front panel of the electric box, and electric heat pipes and sensors and transformers in the electric box. 1. The shell is made of high-quality steel plate with plastic-sprayed surface, which is beautiful and generous. 2. The inner liner is made of stainless steel plate with good corrosion resistance. 3. Temperature control system uses high-precision sensors and integrated components, and digital tube display to make temperature control accurate and reliable.